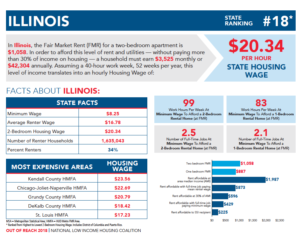 I n 2018, renters in Illinois need to earn $20.34 per hour in order to afford a modest two-bedroom apartment. In order to afford rent and utilities without paying more than 30% of income on housing, a household must earn $42,304 annually. Because our state’s minimum wage is only $8.25, that means a minimum wage earner must work 99 hours per week, 52 weeks per year, just to afford a two-bedroom apartment. In Illinois, there are only 34 rental homes both affordable and available for every 100 renter households considered extremely low-income. 72% of these households are severely cost-burdened, spending more than half of their income on housing.The overall shortage of rental units affordable and available for extremely low income renters is 309,287. Households that are elderly, have a family member with a disability, include minorities, or are headed by females have a greater likelihood of having extremely low incomes than others. Low-income veterans also face severe housing cost burdens. In 2018, a family of four in Illinois was considered by the federal government to be extremely low-income if their annual household income was at or below $24,300. Based on point-in-time counts throughout Illinois on a single night in January 2017, there were 10,798 individuals in our state experiencing homelessness. A majority of persons identified as homeless were staying in emergency shelters or transitional housing, but many were unsheltered, living on the streets, or in cars, abandoned buildings, or other places not intended for human habitation. Families, e.g., households with at least one adult and at least one child, made up 3,904 people in the count. Unaccompanied youth made up 730 people in the count. Veterans made up 864 people in the count. There were 1,475 individuals who fit the definition of being chronically homeless, meaning they were living with a disability and staying in shelters or on the streets for long periods of time or repeatedly. The people identified in the point-in-time count does not reflect the even larger number of people in poverty living “doubled-up” caused by the high level of competition for housing resources and the need to avoid unmanageable housing cost burdens. Doubled-up households have a high-risk of homelessness. Nationally, living with friends or family due to economic need, or “doubling-up,” is the most often cited previous living situation for individuals and families entering the homeless system. In 2016, 30% of working-age adults and 52% of young adults ages 23-29 lived doubled-up with friends or family due to economic need. 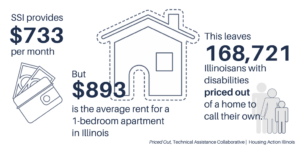 In 2016, there were 168,721 people with disabilities in Illinois living solely or primarily on Supplemental Security Income (SSI) of $733 per month. On average, a person with a disability receiving SSI would have to pay 122% of their monthly income to rent a one-bedroom apartment. Within Illinois’s federally defined housing market areas, the cost of a one-bedroom rental unit reached above 100% of SSI payments in the Chicago/Joliet/Naperville metro area and Kendall County. Since 2007, Illinois has consistently remained at the bottom of state rankings for how well the state supports those with intellectual and developmental disabilities, primarily due to the small portion of people and resources dedicated to those in small, home-like settings. In both 2015 and 2017, Illinois ranked 47th. Illinois does not meet the 80/80 Home and Community Standard, which requires that at least 80% of individuals with intellectual and developmental disabilities are served in the community and 80% of all resources spent on those with intellectual and developmental disabilities are for home and community support. In 2017, Illinois had the fourth highest foreclosure filing rate in the nation, with .86% of all housing units having at least one foreclosure filing. While this represents a 22% decrease in foreclosure rate from 2016, Illinois was one of only 5 states to experience an increase in new foreclosures (up 2%) in 2017. Homeownership can be a powerful wealth-building strategy for low- and middle-income households, and housing tends to appreciate (modestly) in value, but homeownership is still out of reach for millions of Americans. 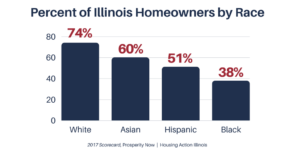 65.3% of Illinoisans own their homes; 1.6 times as many white households are homeowners compared to households of color.